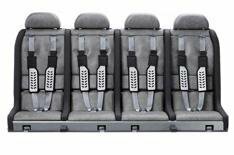 From a newborn to a strapping 12-year-old, the unique Multimac can cater for them all, while seating three, or four, children across one row - even in a supermini like a Ford Fiesta. Generous harness adjustment and decent headrests are all part of the package, but you can't recline any seats. Initial installation should probably be done by a professional since it could involve removing and refitting seatbelt buckles. The slab of seats is heavy, too, but once installed it isn't difficult to use. No, we haven't put an extra digit in the price by mistake. This seat is seriously expensive, but if you plan to have four kids, or work as a nanny, it might be cheaper than getting a mind-boggling combination of different seats for different ages. Quality comes with the price. Seat materials are very good the seats are stitched together by upholsterers that work on Bentleys and all other parts and construction are rock solid.